It’s Discovery Channel’s Shark Week, a week of TV programs dedicated to sharks. Shark Week began in 1988 and is now broadcast in 72 countries. Here’s some educational apps about these creatures who capture the interest of so many people – young and old! 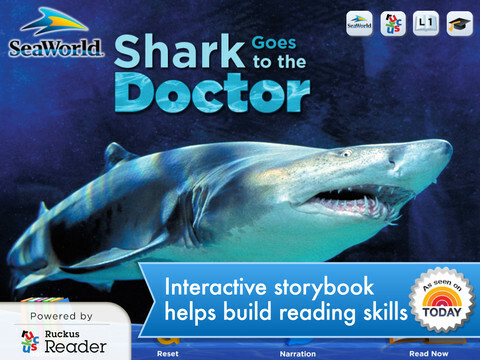 SeaWorld: Ruckus Reader presents – Shark Goes to the Doctor, an engaging story that follows a sand tiger shark as it is checked by vets. Kids learn interesting facts about sharks’ lives. The cost is currently $3.99. FREE – Sea TV is a collaborative effort between Adobe and Monterey Bay Aquarium (a highly ranked U.S. aquarium) to bring its Open Seas Exhibit to your mobile device! The Open Sea is a million gallon exhibit with a 90-foot window. 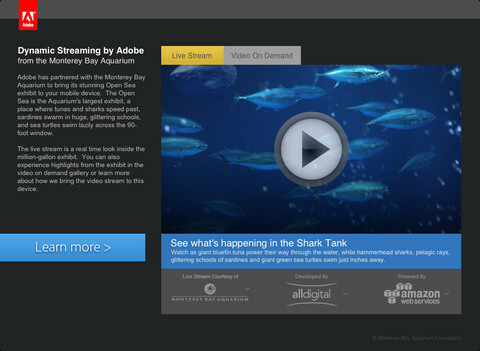 You may see sharks speed past, sardines swimming in glittering schools, and/or sea turtles on the live video stream. You can also watch videos on demand. FREE – Global Shark Tracker lets you follow the navigational pattern of sharks that have been tagged with satellite tracking technology. 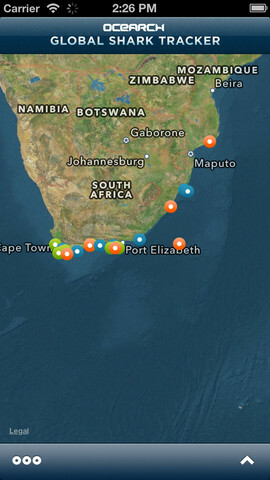 The purpose of this tracking is for shark conservation and the collection of data on the health of sharks. Very cool! Currently $4.99 – Discovery Kids Sharks for kids 6+. 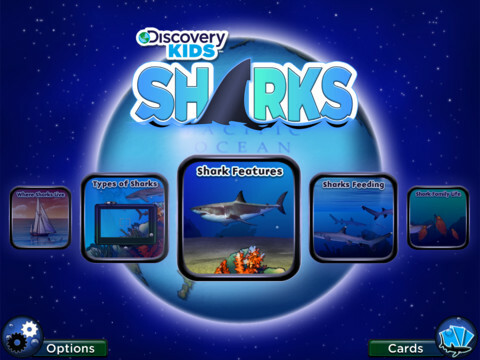 If your child loves sharks, this is a must-have educational app! Kids will learn: shark anatomy, types of sharks, how sharks hunt, where sharks live, and about shark families. 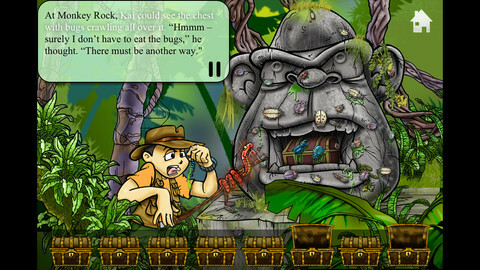 The app includes 5 interactive games and 30 digital trading cards that can be shared via email. 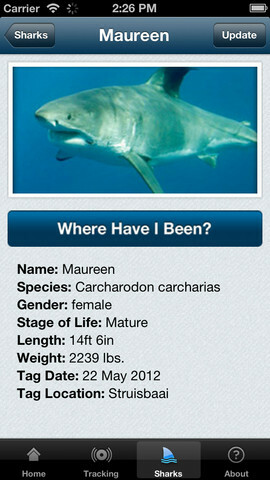 This app has a great mix of videos (from Discovery’s Shark Week files), fabulous photos of sharks in their natural environment, 150+ interesting shark facts, and a few games. Teachers could use the information in this app to teach a lesson on comparing and contrasting – using a Venn diagram or other graphic organizer. 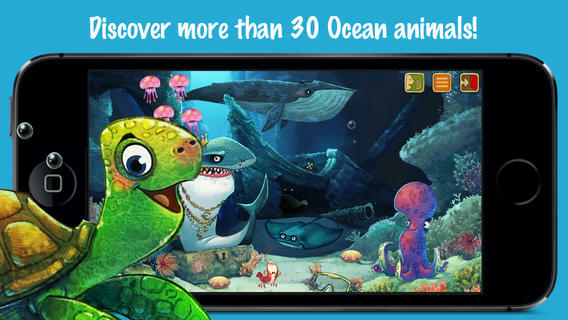 Kids will love learning about sharks using this fun, cool app! Visit the website for a preview http://treasurekai.com/. After reading the story, your child can go back to the website for a variety of extras: watch fun fact videos, go behind the scenes, play a video game, work some puzzles, and more.